I have added a new tree this year. A cupcake themed kitchen tree! I sat last night and made row after row of garlands out of mini cupcake liners. This tree makes me happy every time I look at it. There are little tiny kitchen utensils, candy canes, and ice cream cones mixed in with the cupcakes. Pastel tiny Christmas lights makes it all sparkle! Little desserts peek out from within the branches as do tiny striped balls that remind me of candy. During my picture snapping, my friend Char stopped by. 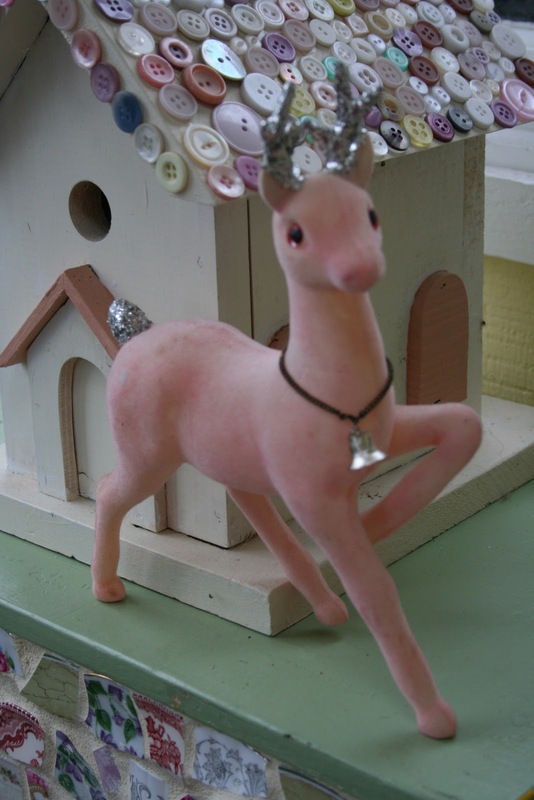 She brought me this wonderful pink flocked, glitter coated deer she found at the resale shop she works at. My happy shout turned into tears of joy as she gave me with this vintage Zondervan box of scripture cards. I have always wanted one of these. Do you see the title? "Daily Manna Promise Box" I just love it! Thank you Char! What a wonderful gift. I know you will enjoy reading the daily verses. An adorable tree..such a cute theme! How sweet and thoughtful of your friend to give you such lovely gifts!!! She is very special. I love your new tree! How creative!!! Come decorate my house!!! (actually started today and put some pics on my blog). I love, love, love the daily verses! What a great tree. 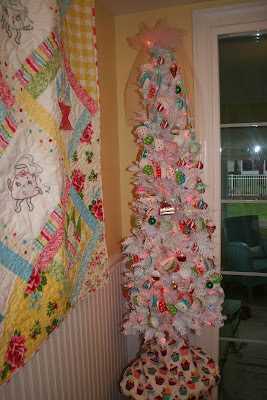 I would never have thought of using cupcake liners for a garland -- they are pefect! Your cupcake tree is so adorable! 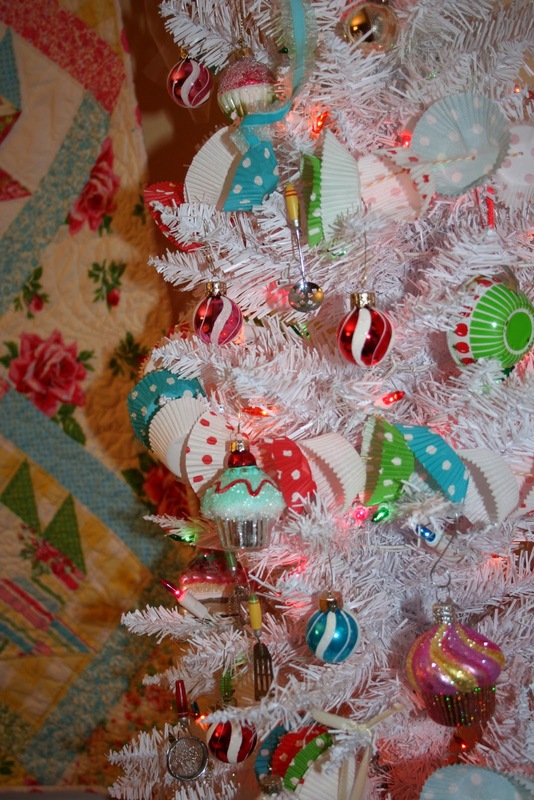 This tree is absolutley my favorite.How cute,and what a great idea for the kitchen too.The cupcake liners are just so adorable.Im being inspired for next year lol. Very cute tree! Love the cupcake garland. My Grandmother has a promise box very similar to yours. So many memories! Love your trees. Cannot imagine how long it must take to set them all up but I bet it is so much fun!!! The cupcake ornaments are too cute. I did a candyland theme in my kitchen this year, so that really appealed to me. Your mom's garland from the post above is so precious! I love your decorations. Very pretty.